Showing 1 - 15 of 19 articles tagged "Lauren Cohan"
ABC has been releasing spoof commercials to promote the spy dramedy starring Cohan and Scott Foley. Did The Walking Dead provide a clue for Lauren Cohan's exit? Showrunner Angela Kang talks about the latest Maggie development. 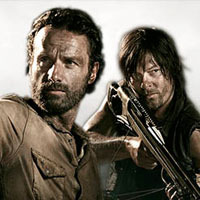 Reedus is set to replace Lincoln as the face of The Walking Dead. Foley will play an FBI "super-agent" opposite Cohan's "badass CIA operative" on the action dramedy. "I’m going back,” Cohan told EW Tuesday night at CinemaCon in Las Vegas. Lauren Cohan defended by Walking Dead co-star: "Pay the woman"